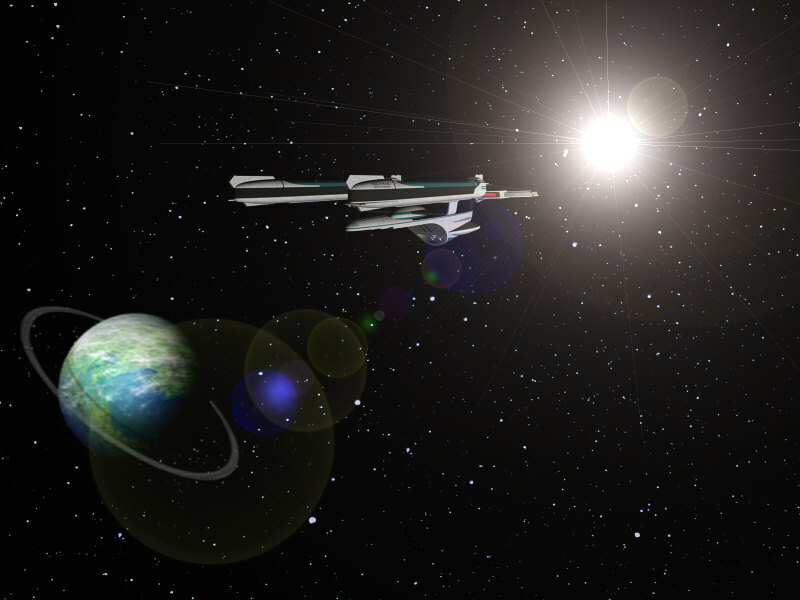 The Excelsior-class USS Enterprise-B orbited around Starbase 6. It had been two years since the ship's maiden voyage that had brought it to the brink while rescuing refugees from the spatial distortion now known as the Nexus. Captain James T. Kirk had gone out in a blaze of glory saving the vessel, her crew, and her passengers and would be forever memorialized for his sacrifice. The Starfleet courier, Treadmill, was delivering a mission specialist to the Enterprise. Captain John Harriman knew Commander Helen Noel had served under Kirk aboard the original, pre-refit Constitution-class Enterprise during her famed five year mission. Three and five year assignments were now standard operating procedure amongst exploration missions. Harriman idly wondered how Noel would react to being aboard the same ship her famed ex-commanding officer had died. As Noel rematerialized onto the Enterprise's Transporter Room-A's pads, Harriman was pleasantly surprised to see that Noel had aged gracefully and was as lovely as ever. She gave him a knowing smile as though his reaction was a typical one. "Welcome aboard, Dr. Noel;" Harriman offered to take her bag. Harriman promptly handed off Noel's duffel to a yeoman who disappeared. "Have Commander and Master Chief Lawton reported in yet?" Noel asked Harriman. "The Exeter is due any minute now to deliver them to us," Harriman told her. A page from the bridge alerted Harriman that the other starship had just arrived. "You'll be holding your reunion in mere moments," Harriman assured Noel. "It'll be strange being aboard an Enterprise again," Noel said wistfully. "We try to live up to the legacy established by her forerunners and those captains and crews," Harriman promised. "I hope you're not trying too hard," Noel smiled warmly, "Sometimes such efforts lead one to distraction and actually impede performance and morale." "I take it this is why you're a psychiatrist," Harriman said ruefully. Noel shrugged, "Just doing what comes naturally." Transporter Chief Harama spoke up, "Captain, the Exeter's transporter room has signaled us. They have personnel ready to transfer over." "Lock on and initiate transport when you're ready," Harriman ordered. Harama did as he was told and soon four people coalesced on the transporter pads. Two were in Starfleet uniform but the other two were plainly civilians. Noel barely contained herself until the two Starfleet specialists stepped off the pads and moved towards her. Noel fiercely hugged the elder officer. "Tracy, it's so good to see you;" Noel enthused and then she stepped back to scrutinize the other woman, "I'm surprised you've gone gray." Tracy Lawton chuckled, "Blonde wasn't my natural color anyway. So the years have had their way. But look at you, you've gone pure white." "With a little help," Noel admitted conspiratorially. "Nevertheless, you've barely aged;" Chief Lawton complained. "Oh, I have but I think I'll refrain from describing how in mixed company;" Noel smirked. "Commander, it's a pleasure to remake your company;" Lt. Commander Alicia Lawton said with utmost sincerity. "The pleasure is all mine, Commander;" Noel said gracefully. "Please, to you I'm just Alicia and always have been;" Lt. Commander Lawton swept away formality. "Is that the captain?" Chief Lawton asked as she eyeballed Harriman talking with the civilians. "Yes," Noel replied, "Is that an issue?" "He's just so young," Chief Lawton observed. "He's older than Jim Kirk was when he was given command of the previous Enterprise," Noel commented. "I suppose," it was obvious there was only one captain of the Enterprise for the former yeoman. "Who is he speaking with?" Noel wondered. "Those two have been attached to our mission," Commander Lawton explained, "But we weren't told in what capacity." Noel frowned, "That's odd. And they didn't discuss it with you prior to your arrival here?" "The gentleman has been increasingly agitated as we approached our rendezvous. I got the impression he didn't want to come aboard," Chief Lawton informed Noel. "He is unhappy about something," Noel observed. "Dr. Soran, I appreciate your coming aboard despite the events leading to your being a passenger before," Harriman graciously told Tolian Soran. "I can't tell you what it took Starfleet to get Tolian to agree to this mission, Captain;" Dr. Erin Reilly said to Harriman, "And I mean that literally. Starfleet swore us both to secrecy." "And it's not your vessel I have a contention with," Soran said vehemently, "It's the mere fact that it's commander decided to rip me from paradise and crush every last hope that I had." "Doctor, we saved your life and the lives of forty-six other El-Aurians;" Harriman insisted. "Did you? Did you really?" Soran sneered, "I would educate you on the realities of this universe but I don't think you'd live long enough to grasp them." "If that's the case, why are you even here?" Harriman fumed. "Because you're going to play a part in recovering a piece of a puzzle that may eventually restore my hopes," Soran told him, "But that is a conversation for a much later date." "Dr. Soran and I will be providing a full mission brief at your convenience, Captain;" Reilly offered, "We'd appreciate it if your Science Officer and any members of their staff they'd like to include were present as well." Harriman went to the comm panel in the wall and contacted Commander Tobiaston, his XO, to set course for their destination. Next he summoned a pair of yeomen to get the guest mission specialists situated. Chief Lawton sighed. "I remember those days," she reminisced. "A little reflection is appropriate aboard this ship," Noel opined. "Hopefully no one will try setting me up with a Charlie Evans this time," Chief Lawton grumbled. "Poor baby," Noel teased, "Now you're scarred for life." "Bite me," Chief Lawton retorted. "If only you'd let me," Noel theatrically sighed before both women broke into laughter. Soran was equally disturbed to discover that Noel and the Lawtons were being included in his briefing alongside the ship's Science Officer, Lt. Sharon Voight. Voight hadn't brought any staffers since they were fully briefed on the cultural mission but she had no idea of what Soran and Reilly were bringing to the table. Soran led by asking why the cultural specialists were present. "Their assignment is to study developments on Ekos and Zeon since the cultural contamination from the Federation observer and the quarantine was established around their star system," Harriman explained, "They are assessing the long term ramifications of John Gill's interference in their development as well as the long term impact of having Captain Kirk and Mr. Spock on Ekos. They directly observed Spock and the physiological differences between a Vulcan and an Ekosian or Zeon." Harriman turned, "Commander Lawton, would you care to elaborate?" "The cultural contamination effectively altered Ekosian and Zeon history," Lt. Commander Lawton continued, "John Gill reshaped societal values. Seeing the extent of our interference, the Federation Council instructed Starfleet to establish a quarantine region around the M34 Alpha star system. That quarantine held until recently when it was broken by the Ekosians themselves." "Who did the Ekosians contact?" Voight inquired. "The Oberth-class USS Copernicus was studying instability factors in the M34 Alpha star when a warp capable Ekosian spacecraft approached her and hailed the crew," Chief Lawton took over, "The Ekosians and Zeons are aware of the stellar instability and decided to seek out the worlds that produced, Gill, Kirk, and Spock." "Just how diversified is the Copernicus' crew?" Harriman asked. "She has an Andorian commander and almost a dozen different Federation races represented aboard," Chief Lawton divulged, "And the Ekosians never batted an eye." "But the Ekosians ostensibly have only met humans and Vulcans," Voight asserted. "That fact combined with their sudden development of warp capable craft versus chemically driven rockets led to this survey mission," Chief Lawton described the background motivators. "Drs. 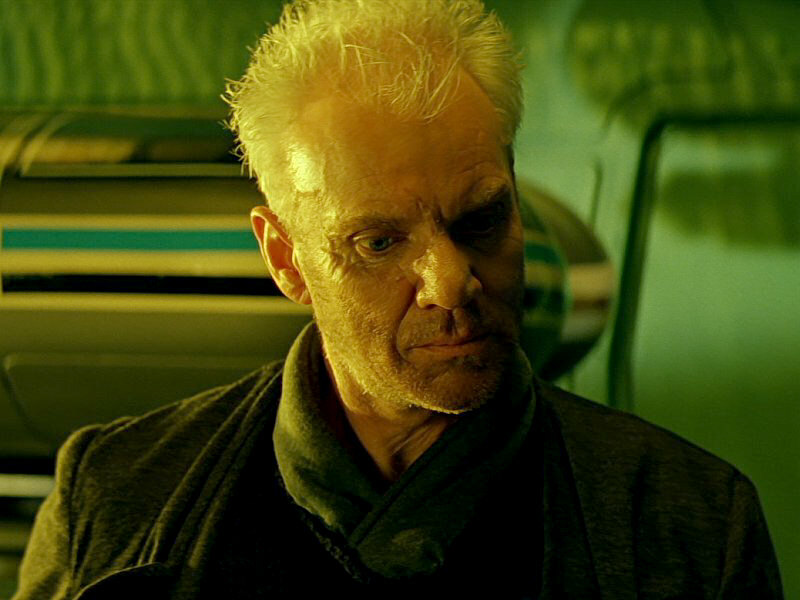 Soran and Reilly, perhaps now would be a good time to explain your presence?" Harriman requested by suggestion. "My specialties are astrophysics and stellar cartography," Soran stated, "I was asked to participate in a two-fold endeavor. One is to ascertain the health of the M34 Alpha star and the other is to support Dr. Reilly as she seeks out rare trace elements." "Why are they of importance?" Voight asked. "The M34 Alpha star is teetering on collapse and for no explainable reason," Soran shared, "Dr. Reilly's minerals may bear a direct relation to the star's current condition." "How?" Voight beat Harriman to the punch. Reilly spoke up, "The trace elements detected by the former Enterprise are extremely rare and also share many traits with dilithium. The Enterprise boasted the most advanced sensors of her day. This ship makes the same claim. When the minerals were detected they were unknown to Federation science. That has changed in the interim." Chief Lawton nodded, "I remember the Geology Department all being abuzz with some strange discovery on M34 Alpha VI. VII, and VIII." "These minerals are unremarkable in their natural, separated state but they can theoretically be fused together into something labeled trilithium," Reilly revealed. "I read that trilithium is a theoretical model. It doesn't exist in nature," Voight shot back. "It doesn't occur naturally but it's believed it can be temporarily stabilized long enough for it to be deployed," Reilly explained. "You said this trilithium is similar to dilithium," Harriman repeated, "Does it share the subspace properties of dilithium?" "Not quite," Soran answered before Reilly could, "Trilithium can halt any and all fusion processes. Including those within a star." Harriman immediately grasped it, "And you think trilithium is causing, or caused, the instabilities in the M34 Alpha star." "It is a reasonable supposition, Captain;" Soran said with an eerie calm, "And I and Dr. Reilly are not alone in believing this." "It's especially reasonable if the Ekosians and Zeons have been in contact with another advanced space faring race," Reilly suggested, "A leading theory amongst the Archeology and Anthropology set at Starfleet." Harriman looked over at the Lawtons. Both were A&A officers. Chief Lawton nodded her agreement. "The leading supposition is that the Ekosians and Zeons have been approached by an unknown party. It would explain how they went from combustible engines to warp propulsion in less than twenty-seven years," Lt. Commander Lawton asserted. "Dr. Soran, how can you be so certain trilithium is responsible for this effect upon the star?" Harriman asked. "Because I studied the effects of trilithium before my people became refugees," Soran replied, "My race harnessed trilithium and attempted to stabilize stars going nova with the substance which only yielded disastrous results." "So you know how to stabilize these minerals once they've become trilithium?" Harriman inquired. Soran chuckled, "No Captain, I do not. I was part of a team that studied the substance's effect upon the test star. I can tell you if trilithium was introduced to the M34 Alpha star then it was a destabilized variant of trilithium. Otherwise the star would have collapsed within minutes rather than the weeks that Starfleet and civilian observatories have monitored so far." "And where are your people from again?" Harriman wondered. Soran looked amused for the first time since coming aboard, "That's a rather clumsy effort to obtain a fact my people have chosen to conceal from the Federation for now." "There are only forty-seven of you," Harriman reminded Soran, "We'd just like you to share before you all..."
"Die?" this time Soran's retort was a bitter one, "I don't think we'll die off for a very long time, Captain." Harriman frowned at being stymied but he quickly moved on, "Lt. Voight, you'll coordinate with Drs. Soran and Reilly. Give them full departmental support." "Yes sir," Voight crisply responded. "As for our observation team, it seems your mission is more vital than ever;" Harriman opined. "Sorry you weren't fully briefed before our arrival," Lt. Commander Lawton remarked, "But we were under orders to bring everyone up to speed after our arrival." "May I ask why?" Harriman asked a little sharply. Noel took the lead on this one, "There is a consensus amongst certain Starfleet officers that you tend to be 'choosy' over your assignments. No one wanted you to refuse a delicate assignment out of a prickly sense of duty." "May I ask which admirals feel this way?" Harriman opted for prickly on this one. "The general consensus is the ringleader is your father," Noel sadly replied. Harriman was tempted to turn about and launch a photon torpedo strike on Starfleet Command, "I'll try not to let my 'choosiness' get in the way of our larger mission." Noel and her comrades winced before Harriman dismissed the entourage. Soran seemed perfectly delighted. While in transit, the Lawtons and Noel reviewed the original logs filed by Kirk, Spock, and McCoy. Noel recalled discussing the planetary psyche with McCoy after the mission. Chief Lawton had just been bumped up from being a sciences yeoman to being accredited by the ship's A&A Department and joining their staff full time. Chief Lawton had been involved in the case study of the effects of violating the Prime Directive. Years later, her daughter would utilize that case study to write her graduating thesis. Lt. Commander Lawton revisited the Ekosian and Zeon matter throughout her career so far and was widely viewed as the so-called "expert" on the cultures. John Gill's reports had described the early industrial culture in which he'd arrived in. The arrival of the Zeons in interplanetary rockets had catapulted the Ekosians into a mass state of fear. The economy was shattered as the planetary citizenry hunkered down and awaited Armageddon. Gill had opted to intervene and remodeled the society on the basis of the fascist state of Nazi Germany on Earth. Gill's assistant, Melakon, corrupted Gill's efforts and revived the worst atrocities of the human Nazi era by targeting a genocidal campaign at the Zeons. Kirk and Spock, looking for Gill, encountered the Nazi prejudices first hand. Escaping, they met with a united underground movement made up of Zeons and sympathetic Ekosians. Revealing that Gill had been sedated for years, the Starfleet officers witnessed Melakon murder his former mentor. Nazi Chairman Eneg then arrested the Deputy Fuhrer and rose to the position of Fuhrer himself. As the Starfleet personnel departed, Eneg swore that the party would return to its idealistic beginnings and abandon its hatred of all things non-Ekosian. Kirk, Spock, and McCoy had all mentioned in their logs their curiosity as to whether a Nazi state could exist peacefully without focusing intense, paranoid hatred upon another racial group. It was unprecedented on both Earth and Ekos. Long range monitoring of transmission stemming from the M34 Alpha star system had indicated that the Ekosians and Zeons had partnered together to improve the lives of their people. The Zeons had traditionally been more advanced than the neighboring Ekosians. The jealousy stemming from this fact had birthed Melakon's hatred and his campaign to destroy Zeon. But signals intercepts indicated Eneg had tapped into the Zeons' potential and utilized it to advance his own culture. It was an event that could have played out if Earth had reacted violently to First Contact with the Vulcan explorers that landed to investigate Zefram Cochrane's warp engine test flight. And if that had occurred, where would it have ultimately led? Soran and Reilly spent a great deal of time with Voight. They both went over the specifications on how they wanted the sensors allocated between them and what settings they wanted them at. Voight pointed out to the pair of scientists that the primary sensors weren't usually refined as tightly as Reilly wanted for her project. Voight finally asked why Soran only wanted a broadband scan resolution of the star, "What are you trying to accomplish?" "Very little, Lieutenant;" Soran admitted, "I'm merely observing the star to witness its death throes from a unique vantage point." "You think the M34 Alpha star is going to implode?" Voight was surprised. "If trilithium was introduced to the star then it will implode and then the shock wave created by that implosion will sweep away this entire solar system," Soran lectured her, "The star was quite healthy when Commander Spock surveyed the system. He and his departments were quite thorough. An outside factor created the present instabilities and the likely cause is trilithium. If so, then our observations become even more unique." "But what about the natives of that solar system?" Voight wondered. "You'd best hope your observation team has the opportunity to gain a broad understanding of those cultures," Soran advised, "Because they are going to be obliterated." Voight wasn't certain whether to be more horrified by Soran's words or the dispassionate way he uttered them. The Enterprise-B was intercepted near M34 Alpha IX by two Ekosian ships. They looked roughly like a cross between an Earth NX-class and a Romulan Bird of Prey. Harriman voiced that opinion and Voight commented on it. "The ships do appear to be capable of Warp 5 velocities," she said as she scanned the vessels. "How is that possible?" Harriman asked to everyone listening, "It took Earth eighty years to progress from Cochrane's Phoenix to the original Enterprise. How did these people make the jump from pre-space flight to interstellar travel in less than thirty years?" "That may be why the Copernicus crew felt that someone else violated our quarantine of the system," Lt. Demora Sulu ventured from the helm. "I definitely believe they were on to something now," Harriman admitted, "Commander Tobiaston, hail them." Tobiaston worked his communications board, "They're replying, Captain." "Put it on screen," Harriman instructed. A platinum blonde woman appeared wearing the gray and black uniform of the Luftwaffe. The crew had been briefed enough on the German inspired Nazi uniforms to differentiate between services. They also knew the Luftwaffe, the Wehrmacht, and the Kriegsmarine were military branches not Nazi party organs. The only true Nazi militant organizations were the SS and the Gestapo. Apparently the Ekosian space forces were under the control of the Luftwaffe. Earth's beginning ventures into space had been dominated by military influences. It wasn't until after World War III and the beginning of a united Earth government that Starfleet was created as a scientific, exploratory, and defensive organization. "Greetings, I'm Captain John Harriman of the USS Enterprise;" he said to the vision on the screen, "I bring messages of friendship from the entire United Federation of Planets and from Earth, the birth place of John Gill." The blonde nodded, "Hello Captain, I am Colonel Heike. I'm the commanding officer of the EZ Blitzkrieg. I am also a squadron commander for the Ekosian Space Forces." "May I ask how large your space force is?" Harriman inquired, "When we last encountered your people, you were barely transiting between the third and fourth worlds of your solar system in chemically propelled rockets. Now you're utilizing subspace to exceed the speed of light. You did this in less than thirty of our standard years. It took my people nearly a century to do the same." Heike smirked, "Perhaps your people are just slower than mine." Harriman barely avoided wincing, "Perhaps. We're here at your people's request and we'd like to place observers on both Ekos and Zeon to see the changes that have occurred since we last encountered your people." "That would be acceptable if you are prepared to study the strange dimming and contraction of our sun," Heike countered. "We've brought specialists in the appropriate fields to answer your questions regarding the health of your star," Harriman assured her. "Excellent, then I am to extend an invitation to our worlds at the behest of the Fuhrer," Heike informed Harriman, "And we are to act as your honor guard." Harriman knew he didn't require an honor guard but diplomacy made him acquiesce to the Ekosian insistence. For a people that had sought out the Federation and asked for assistance the colonel was very wary of Harriman and his ship. This only lent credence to the theory that the Ekosians and Zeons had been met by another outside race. But who was the question on everyone's minds. The Enterprise and her escorts reached the fourth planet in the M34 Alpha system and dropped Chief Lawton off on Zeon. It soon became apparent that Heike had called ahead because the Zeons were ready to roll out the red carpet by the time Lawton beamed down. After the initial greetings were made and introductions flowed like water, Chief Lawton checked in with the Enterprise; "Another compelling factor to our theory someone else has been here ahead of us is the fact the Zeons didn't bat an eye at the use of the transporter." "Find out what you can, Chief;" Harriman instructed, "Diplomacy is a secondary concern since the deteriorating health of M34 Alpha might be a direct result of those same visitors." "Understood," Chief Lawton said before closing her clamshell communicator. Harriman joined Noel and Lt. Commander Lawton's landing party. Heike was already in the plaza waiting for them. Lt. Commander Lawton reached the obvious conclusion, "Your people have transporters as well." "Correct," Heike confirmed it, "However the technology is new to us. Just as our ships aren't as fast as yours or as capable so too our transporters are far more limited in range and accuracy." "But once again I have to ask how you developed the technology so quickly," Harriman interjected. "That is for the Fuhrer to divulge should he choose to," Heike demurred. A hover car arrived to transport the landing party to the Reichstag. All of the Starfleet personnel knew that a mere twenty-seven years ago the Ekosian has relied upon petroleum fueled combustion engines to drive wheeled vehicles to and fro. As the car lifted and flew across the capitol more and more air cars could be seen skimming around. The air car deposited them at the Reichstag building. There, armed SS guards waved tricorders and sensor wands over the Starfleet officers. Heike was simply waved through. She waited for Harriman and his party to be cleared. "You have to forgive us but we've had occasion to doubt the veracity of strangers," Heike explained. "Who were these 'strangers'?" Harriman asked. "Again, that is for the Fuhrer to reveal;" Heike bowed out of the query. "Interesting sentiment coming from a Zeon," Noel opined. Heike cast an amused glance Noel's way, "I may be genetically a Zeon but I was born on Ekos during the collapse of its society. I witnessed John Gill's miraculous transformation of the people here and I endured Melakon's insanity as well." "Fuhrer Eneg was a friend of Zeons when he was Chairman of the Nazi Party and he continues to be one to this day. He bridged the gulf between our worlds and now we are stronger united then separated," Heike described the events of the past. Heike brought the trio to an antechamber where two Ekosians in Nazi livery awaited them. The male wore the Party brown shirt and the woman wore the uniform of the Gestapo. That fact rather startled Lt. Commander Lawton. "It seems you've gone from being a Hero of the Reich to a Reichsfuhrer," she said, "You are Daras, are you not?" "Yes, I am. You seem to know of my past actions against Melakon," Daras guessed, "So it must surprise you that I have become Chief of State Security since then." "Everything about your people's recent past seems to be surprising," Harriman ventured. Daras took this in stride, "This is Deputy Fuhrer Oram. He is a far cry from Melakon, I can assure you." "Colonel Heike mentioned that Party Chairman Eneg had become Fuhrer over the years of our separation," Noel spoke up, "I trust he is well." "The Fuhrer enjoys excellent health," Daras nodded, "He saved us from Melakon's madness and brought us to a new age of prosperity and discovery." "Some of those discoveries have led to incredible technological leaps," Harriman voiced. "That is for the Fuhrer to discuss," Daras' tone cooled considerably. "We have to warn him and the rest of your combined peoples that your good fortune has probably come to an end," Harriman spoke. "That is what we have feared," Daras admitted, "But there is hope that your great civilization can assist us." "Even we can't fix a broken star," Harriman tried to let her down easy. "Then you'll have to find other ways of helping," Daras asserted. A chime resounded and Oram stepped forward, "The Fuhrer will see you now." Fuhrer Eneg did appear quite healthy. In fact, he looked healthier than the much younger Oram. He also looked inordinately pleased to see Starfleet personnel as he rounded his expansive desk. "Welcome all of you," Eneg beamed, "I'm so grateful that the Federation deemed it fit to send us representatives to help us assess the health and fate of our sun." "How much do you know about what's happened to your sun?" Harriman asked. "We have every reason to believe its current instability is the direct result of tampering," Eneg stated. "And what makes you say that?" Harriman wondered. "Because we were visited by other aliens after Melakon killed John Gill and Captain Kirk and his officers returned to the Federation," Eneg readily admitted, "They offered us technological advances in exchange for unrestricted mining rights to the sixth through eighth planets in our solar system. The Chancellor of the Zeons and I readily agreed and things seemed to progress peacefully but before our so-called 'benefactors' left, they poisoned our sun." "How can you be certain of this?" Harriman had to know. "Our long range telescopes observed one of the alien ships launch something into our star. It quickly departed after that and our sun has been quickly destabilizing ever since. The Zeon scientists leading the investigation say it will collapse very soon. We asked you here to verify or deny that assessment," Eneg said. "Who were your visitors?" Noel redirected the conversation. "They said they were Vulcans like Mr. Spock," Daras told her. Harriman scowled, "I rather doubt that Vulcans would break the quarantine and flagrantly defy the Prime Directive." The Ekosians all looked puzzled. 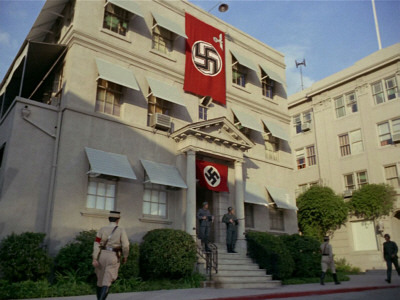 Eneg spoke at last, "Fuhrer Gill spoke of a 'Prime Directive' and why he spurned it." Lt. 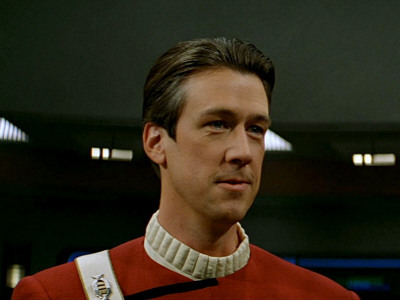 Commander Lawton explained about the Prime Directive and its importance to the Federation. Next she described how Starfleet had imposed a quarantine around the M34 Alpha system in order to protect the natural cultural development of Ekos and Zeon. Deputy Fuhrer Oram scoffed. "Fuhrer Gill threw all of that away when he saved our world," Oran argued, "Why maintain the pretense of noninterference when interference had already justly occurred?" "Perhaps these Vulcans felt as John Gill did," Eneg suggested. "Vulcans are driven by logic. It dictates their every action," Noel replied, "They pursue this ethos to the point that they appear emotionless even though that's a far cry from the truth." "But the Vulcans that visited here could be quite jovial," Daras informed the Starfleet group, "Of course; they generally seemed quite haughty and smug. They obviously felt they were our superiors." "Yes, they admired our system of government but practically sneered at our technological advancement," Eneg recalled. "The Federation is aware of two other Vulcanoid races that left their common home world," Lt. Commander Lawton explained, "They are the Rigellians and the Romulans. Does either name strike a chord?" "Their leader briefly mentioned Rigellians at one point," Eneg admitted. "Perhaps they were of that people group," Oram tried to be helpful. "What was their leader's name?" Harriman wanted to know. "Her name was Alera and she held the rank of Fleet Commander," Daras shared, "She commanded six ships in total." "What was the name of her ship?" Harriman wondered. "She referred to it as the Dagger's Thrust," Daras answered. "These are all Romulan titles and names," Lt. Commander Lawton advised Harriman. "But why would the Romulans risk a war by crossing the Neutral Zone and travel this far away from the Star Empire?" Lt. Commander Lawton asked. "Commander Alera said the minerals in our outer planets were very rare and valuable," Oram offered up. Harriman was reminded of Reilly's words, "I think it's time my crew checked out those planets." 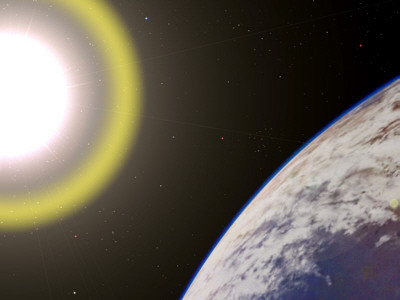 "Very well, Captain;" Eneg allowed, "May I ask when you'll conduct your solar surveys?" "At the same time we're conducting our mineralogical surveys," Harriman assured the Fuhrer, "My ship has the capabilities to do both simultaneously." Unconstrained from using the transporter, Harriman was whisked away upon request. Lt. Commander Lawton turned to the Ekosian leaders, "Now, may Dr. Noel and I partake of your world?" "Certainly," Eneg nodded his approval, "Reichsfuhrer Daras will see to it." As Daras led the Starfleet officers out of the Fuhrer's offices, Oram turned to Eneg; "Is this such a wise idea?" "John Gill came from their culture and look what he did for us with just an encyclopedia database," Eneg reminded his protégé, "Imagine what they can do with a starship." "But Alera promised us great things as well," Oram said bitterly, "And she betrayed us all." Eneg gave Oram a sympathetic look, "I know you were smitten with our visitors' commander but you'll note that these Starfleet officers didn't make any demands in exchange for their services to us. They are willing to simply give of themselves, just as John Gill did." "That is why you are courting them?" Oran wondered. "They may have a solution for our problem or they may be able to save our dual civilizations should we have to abandon our worlds," Eneg stated. "But you're talking about evacuating over two billion people between Ekos and Zeon," Oram said aghast, "Can such a thing be done?" "John Gill's database indicated that there were ninety worlds in this 'United Federation of Planets'. If we consider what two worlds can accomplish together, try and imagine what ninety can do when working with one intent;" Eneg shared his vision. "I think it's time to hear Colonel Heike's sensor analysis of their ship," Oram thrust the idea forward, "Just so we can accurately determine if they can really help us." "I agree," Eneg put forward. The Enterprise assumed orbit over M34 Alpha VII. She had already put into orbit over the sixth planet in the system and the scowled on Reilly's face gave the fact that her readings were the same to Harriman and Voight. Frustrated, the geologist pushed away from the sensor hood. "Perhaps the sensors aren't properly aligned," Voight offered. "No, Lieutenant. Your people did their work perfectly. The minerals we're after are just gone," Reilly's temper was cooling and despondency was taking its place. "But I'm assuming that there are indications of mining operations," Harriman put forth, "Just like on M34 Alpha VI." "Captain, I'd like to take a team down to the surface to examine these mining camps;" Voight requested, "Maybe we'll find clues as to who did the mining and thereby determine where the minerals are headed." "Assemble a team and have Security Chief Giotto assign you three guards in case there are booby traps are other antipersonnel devices," Harriman insisted. "I'd like to go too," Reilly spoke up. "Very well, Doctor;" Harriman conceded, "But Lt. Voight is in charge. Understood?" "Perfectly," Reilly's head bobbed causing her ponytail to sway like it was a real tail. "Then permission granted," Harriman stepped back, "And good luck." Harriman approached Soran, "Anything, Doctor?" "Everything," Soran said with some satisfaction, "And none of it bodes well for the natives." "Is the star's instabilities a result of an injection of trilithium?" Harriman got straight to the point. "Oh yes," Soran confirmed Harriman's fears, "But the trilithium must have not been stabilized when it entered the star's corona. The theoretical models show a temporarily stabilized trilithium delivery would collapse a star within minutes. This one has been contracting for nearly eight weeks. But the rate of collapse is increasing exponentially." "How long until implosion?" Harriman asked. "Fourteen days, maybe thirty at the extreme end of things. But the latter is an improbability," Soran warned. "Can we reverse the process and revive this star?" Harriman knew it was a desperate question but he had to ask it. "Captain, your favorite deity of choice couldn't revive this star at this point;" Soran proclaimed the death knell of the solar system. Voight's landing party found the remains of a pressure domed camp. The miners would have been required to work in environmental suits like her team wore. The Security detachment investigated the interiors of several domes. Voight, her staff geologist, and Reilly investigated the mining operation. A landslide partially covered a suited body. The face plate had been shattered and the wearer had been exposed to vacuum. It was an ugly death but it allowed Voight to gather DNA samples while Reilly led the investigation of the mining pit. The landing party returned to the Enterprise and Voight oversaw the science department's analysis of the artifacts the security detachment had recovered. The medical staff analyzed the DNA. In the end it was a conclusive determination from all involved that the operation had been conducted by the Romulans. Harriman was startled in his Ready Room when the yellow alert siren sounded. Entering the bridge, he found a distinctly Romulan ship staring down his own on the main viewer. Harriman immediately leapt into action. "Report!" he asked of Tobiaston. "The ship just decloaked right in front of us," Tobiaston informed Harriman, "So far, she's taken no hostile action." "What class of ship is that?" Harriman wanted to know. It closely resembled a Bird of Prey but had several distinct differences. Harriman had never seen one before. "It's a Bird of Vengeance-class," Sulu reported, "They're not Imperial military. They were used by Romulan privateers for scouting missions and anti-piracy operations." "They also did a fair bit of piracy work themselves," Tobiaston recalled, "The ship class was largely retired some fifteen years ago when the Bird of Preys were phased out." "Has she identified herself?" Harriman wondered. "The ID transponder is being translated as the Darkstar," Tobiaston reported, "Starfleet Intelligence has her flagged but there's no indication of why." "Are they responding to our hails?" Harriman wondered. "Not yet," Tobiaston told him, "They're still running silent. I'd have to...wait! They're counter-signaling. They want to parlay. The ship's commander is requesting visual communications." "Put them on screen," Harriman decided. A plainly clothed Romulan woman sat upon the Darkstar's command seat. She wore a simple jumpsuit similar to those worn by Earth's Starfleet in the Earth-Romulan War. She also had an unmistakably regal bearing. "Greetings Captain Harriman," she said, "I am Commander Aelynn. I must say I'm pleased that you're here." It took Harriman a second to realize Aelynn wasn't using a universal translator. She was actually speaking Federation Standard-English, "You know who I am?" Aelynn smirked, "There are few in the Star Empire who do not know which captain commands the flagship of the vaunted Starfleet." "How is it you speak my language?" Harriman wondered. An air of sadness filtered through Aelynn's expression even though she tried to disguise it, "The rumors that human prisoners were brought back to Romulus are true. My mother received a starship captain to be her personal servant from her husband. Imagine the admiral's chagrin when it was discovered that human had actually been the father of the admiral's two 'daughters'? The human was sent to the dilithium mines on Remus and my mother, sister, and I were exiled to a colony world." "You're half human?" Harriman was astonished that Aelynn was even willing to admit such a thing. Aelynn nodded, "And so is my sister. A so-called 'stigma' that drives her every action." "Why are you here?" Harriman wanted to know. "Because, as you already know, Fleet Commander Alera has already been here and committed a great atrocity by poisoning the local star. Alera is also my sister. It seems I shall be burdened for the rest of my life cleaning up after her crimes," Aelynn said sadly. "So why are you glad to see us?" Harriman inquired sharply, "If we're here then your sister's crime will be exposed. The star's implosion will erase all evidence of her genocide. But if we bear witness to it the entire Federation will also bear witness and she will be sought for crimes against sentience. How is that cleaning up?" Aelynn looked at him as though he were addled, "No one in the Star Empire will ever condemn my sister's actions here. Yet they must be exposed and Alera must face the consequences of what she has done. That is where you come in." "I'm not crossing the Neutral Zone to pursue her no matter what her crime is," Harriman retorted. From the look in Aelynn's eyes, Harriman had the distinct impression that if he'd been within arm's reach Aelynn would have strangled him at that point; "You're role here is to evacuate these planets. I will find Alera and bring her to you." "How?" Harriman had to ask. "How is unimportant. Grant me thirty of your days and then meet me at the coordinates I shall provide. I will make delivery then," Aelynn promised, "Or I shall be dead." "Captain, the BoV is cloaking," Sulu reported. Harriman swiveled his chair to face the communications station, "Commander Tobiaston, did you get the promised coordinates?" "I did," Tobiaston nodded gravely. "Transfer them to the helm," Harriman instructed. Sulu nodded her receipt of the spatial location before Harriman faced Soran, "Commander Tobiaston, have Dr. Reilly meet us in the main briefing room. Dr. Soran, are you up to helping me convince Starfleet to save these people?" "Believe it or not Captain; I have some empathy for these people. I'm a fellow refugee. Or at least I will be if they survive," Soran stated. "Let's hope they do," Harriman said grimly as he led Soran to the turbolift. It took a few hours of climbing through Starfleet's ever increasingly labyrinthine bureaucracy to finally reach Starfleet's Fleet Admiral, Lydia Parsel. Parsel had been fully briefed on the scientific aspects of the situation. Yet she had Soran and Reilly run through it one more time. Soran was getting irritable again, "Why must we repeat the same data we've been espousing since we began this futile process?" "Dr. Soran, I understand you're impatience with Starfleet. After all, it must seem to you that we killed hundreds of your fellow El-Aurians," Parsel said. "No, only forty-seven of them;" Soran tersely rebutted her. "Well, there hoops that must be jumped through before Starfleet can be mobilized;" Parsel warned him, "And one of those hoops is a recently elected president who has no scope of what to do with an organization like Starfleet. If she had her way, Starfleet would be disbanded and the fleet mothballed and then beings like the Gorn and the Romulans could simply conquer the Federation." Parsel listened intently to Soran and Reilly as they repeated their reports. Harriman replayed his flight recorder logs of his conversation with Aelynn. Parsel thanked Soran and Reilly and asked them to return to their studies. Parsel the focused her attention entirely on Harriman, "Captain, what I'm about to discuss with you is classified far above 'Top Secret'. This is nearly an "Omega' level matter. Is that understood?" "Understood," Harriman said though he truly didn't understand. "Starfleet has had dealings with Commander Aelynn for some time. It began when she was simply the 2nd Officer aboard the Darkstar. She was instrumental in convincing the original commander in cooperating with Starfleet. Later, Aelynn rose to Subcommander and eventually to Commander of the ship." "Aelynn was instrumental in extracting a Mira Romaine off of Romulus when a team from Memory Alpha was invited to Romulus to exchange information after the V'ger incident. Some unknown agency had recruited Romaine, who was Deputy Archivist of Memory Alpha at the time to commit an act of espionage while on Romulus. Romaine was detected breaking into the Romulans' secure data net and extracting military secrets. The Darkstar brought Romaine across the Neutral Zone and then returned to the Star Empire," Parsel explained, "The murky part is that Alera was assigned to transport the Starfleet staffers to and from Romulus. Her credibility took a hit and she's been fanatical about proving her loyalty ever since." "Alera is everything Aelynn is not. She's an ambitious hag and is a very outspoken proponent of renewing hostilities with Earth and the Federation," Parsel revealed, "If Alera has a weapon capable of destroying entire solar systems, she will use it at the earliest possible opportunity." "If Aelynn is a known quantity, why were you surprised when her name came up?" Harriman wondered. "Because Starfleet hasn't heard from Aelynn over the last ten years," Parsel shared, "When Alera made Fleet Commander she went on a tirade purging her family of 'undesirable' elements. Aelynn's name was at the head of the list. Frankly, we thought she'd been caught up with and was dead." "Alera does sound...unpleasant," Harriman allowed. "Make no mistake, Captain. Alera climbed the chain of command on the corpses of her enemies while being drenched in her victim's blood," Parsel warned. "So you want me at this rendezvous?" Harriman asked. "Yes, if we can get our hands on Alera we'll have removed a very real threat to our civilization. And if Aelynn delivers it will be at great personal cost and risk. Offer her a safe haven," Parsel ordered. "What about the local situation?" Harriman wanted to know. "Stay on station. Commander Lawton's mission has changed to one of coordinating the evacuation with the locals," Parsel informed him. "So you do expect to evacuate?" Harriman was hopeful at last. "Saving two civilizations from extinction will play well for the UFP President's image. She'll want to capitalize on that," Parsel was already prepared for a game of realpolitik, "Soran will monitor the star's collapse in process. Reilly will analyze the mineralogical component to its deterioration and try to deduce how the trilithium was synthesized to begin with, imperfectly or not. Meanwhile you'll be our point man while I mobilize every available Starfleet ship, mobilize the Merchant Marine, and hopefully recruit some damn passenger liners." "Yes, ma'am;" Harriman said crisply. "And Captain Harriman, I know the Ekosians and Zeons fate rests in good hands;" Parsel assured him. "Good luck, Admiral;" Harriman signed off. En route to Ekos, Harriman signaled Chief Lawton on Zeon and told her of her changing mission. The Enterprise made a brief stopover Zeon to beam down the ship's A&A Officer and an administrative yeoman. Chief Lawton had already been quietly preparing for the shift in emphasis. As she explained to Harriman, "The Zeons are well aware of the need to evacuate. They've been organizing for several weeks now." "Just so long as these people are ready to go at a moment's notice, Chief. Fleet Admiral Parsel is going to be throwing every ship she can sideline but no one, not even her, knows when they'll be arriving. And Dr. Soran can't get any more accurate than a possible final collapse between fourteen to thirty days," Harriman warned. "You bring such cheerful news Captain. You make me feel better already," Chief Lawton quipped. "I aim to please," Harriman remarked right back. Lt. Commander Lawton had a similar report as her mother, "The Ekosians have been prepping everyone for a hasty departure ever since the Zeon scientists first reported the star's eventual demise. They're frighteningly organized." "We're still jumping through the political hoops right now but Admiral Parsel already has a plan in place. Once Starfleet gets authorization to act, we'll commence. In the meantime, it wouldn't surprise me if she starts moving assets into the region to go at a moment's notice," Harriman commented as they met face to face. "Parsel is known as a proactive leader," Noel confessed. "How long do we have?" Lt. Commander Lawton asked. "Soran estimates we have fourteen days. Maybe thirty. But I think he said the last just to humor me," Harriman advised them. "We'll tell Fuhrer Eneg he has fourteen days. The truth is always better than a well intentioned lie," Noel commented. Harriman was impressed. It had taken six days before the first ships arrived but Parsel was good to her word. She'd literally mobilized and redirected the entire Merchant Marine to the M34 Alpha system. A dozen Starfleet starships had also arrived. Last to arrive had been the cruise liners. Now, in the last hours of the fourteenth day since Soran made his estimates, the cruise ships were boarding passengers. "Captain, how much longer will it take to load these last passengers?" Soran demanded to know. "The ground based estimates say four hours," Harriman tried not to backhand Soran. "They don't have that long," Soran predicted, "They have thirty minutes at best." "What?" Harriman yelped as he came out of his chair. "The star is in a cascading collapse. This is it, Captain;" Soran told him. "Tobiaston, tell these cruise ships to get everyone aboard. Forget the luggage and just move them. Now!" Harriman ordered as his XO scrambled to get the order issued. "Lt. Sulu, prepare an exit course, Warp 1. Initiate on my mark," Harriman instructed. Idly his mind went back to his first event on this ship; This is what it means to sit in this chair. Moment's like this define us. James T. Kirk had sacrificed himself for this ship and the El-Aurian survivors. Harriman wasn't about to abandon the Ekosians and Zeons now. He swiveled around to face Tobiaston. "Find out where the evacuation needs extra support and route that location to the helm," Harriman turned around to Sulu, "Bring us to those coordinates and put us in orbit over them." Harriman tapped his chair's comm control, "Bridge to Transporter Room, prepare to begin evacuating ground personnel." The Enterprise moved into orbit over Zeon. Twenty-nine minutes later Harriman got an all clear from Tobiaston, "Captain, all ships are reporting every refugee has boarded." "Send everyone our exit vector and have them follow us out at warp speed," Harriman instructed, "Take us out, Demora." The Enterprise exited the M34 Alpha star system as the primary collapse and a Level 12 shock wave obliterated the planets that had once orbited the star. A shudder passed through the ship and Sulu reported, "Gravitational eddies have just forced us to make minor course corrections." "Sir, the previously departed ships are reporting making course corrections as well. Everything in this sector has," Tobiaston informed Harriman. Soran seemed particularly intrigued by that fact. Sulu turned to face Harriman, "Are we still setting course for the colonies on Umoth and Ronara Prime?" "Yes," Harriman nodded, "With a detour to Starbase 6 to drop off Drs. Soran and Reilly." "Yes sir," Sulu implemented the course and set forth at Warp 5. Thirty days after the Darkstar had contacted the Enterprise the two ships reunited near Sherman's Planet. Klingon Defense Force ships were utilizing Deep Space K-7's recreational facilities. Harriman was only half surprised when he was hailed by thin air. Aelynn's features appeared on his Ready Room's comp/comm screen, "Greetings again Captain, now you can see I am a woman of my word." "I believed you were after speaking with Admiral Parsel," Harriman confessed. That brought a merry twinkle to Aelynn's eyes, "And how is Lydia these days?" "She's recently been promoted to Fleet Admiral," Harriman informed her. "Well, that certainly bodes ill for the Federation's enemies;" Aelynn was genuinely amused. "Do you actually have Fleet Commander Alera aboard?" Harriman had to wonder. "Much to her own chagrin," Aelynn said soberly, "Which brings me to my next point. My crew and I have burned our last bridges in the Star Empire. We are now considered traitors and there is no sanctuary for us within Imperial space." "Admiral Parsel has a remedy. There is a new Federation colony called Shial. It's near Dorvan V. It's populated by Romulan defectors and Vulcans who adhere to the tenets of a man named Sybok. As I understand it, the two groups fit right in with each other," Harriman offered, "I'll transmit the coordinates to you and then you can transport Alera to our Cargo Bay One." "I thank you for your assistance in this matter, Captain;" Aelynn said gratefully, "Perhaps you will make time to visit this 'Shial' in the future and we can meet properly at long last." "I would look forward to that, Commander;" Harriman admitted. "Then you shall have to call me 'Aelynn' from now on," she insisted. And Harriman knew that a bridge had been built.